It is hard to know exactly how solid Luis Buñuel’s cultural capital is these days. The economy of film’s memory is shifting under our feet, and sometimes to be too well remembered can mean one is already half-forgotten. Luckily, Buñuel has reached that point at which he becomes grist for adaptations, something that always buoys one’s reputation. Thomas Adès’ operatic adaptation of The Exterminating Angel (1962) was released last year, and just played at the Metropolitan Opera (and, through their wonderful cinema program, to movie theaters across the country). Meanwhile, Stephen Sondheim’s musical adaptation of The Exterminating Angel and The Discreet Charm of the Bourgeoisie (1972) idles toward release. I haven’t seen Adès’ opera yet, but even the existence of these two adaptations places these two films in a new light. What is it about them that raises such musical interest? For The Exterminating Angel, the most obvious answer is rather pat. The film is set at a dinner party following the performance of an opera; several of the performers are attending, and a few opera jokes are tossed around in the first half hour. A piano sonata is played—there is in general a musical atmosphere. Sure, but that doesn’t survive the revelation of the film’s conceit. Having spent an evening tolerating one another’s company, the guests slowly realize that they can’t leave. There’s no force preventing them, but for some reason they simply can’t bring themselves to walk through the door out of the mansion’s wing. It’s a fantastic idea, and Buñuel has wonderful fun with it. (The police, for example, set up a heavily guarded perimeter—even though it is, they admit, just as impossible to enter the house as to leave it.) But once the absurdity of the premise is accepted, what we end up with is another movie about the barbarous breakdown of the upper class. The core of the film, the million petty ways in which the inhabitants aggravate one another, could play out just as easily on a deserted island, around a plane that crash-landed in the Alps, or anywhere else. In other words, the surreality does not suffuse the push of the film. The Discreet Charm is a movie that is structurally opposite in the way only two very similar films can be. Instead of a dinner party that refuses to end, the dinner party refuses to start. We begin with one dinner, planned by four upper middle-class couples, but every time they are about to sit down for dinner something interrupts them—at first, relatively simply (there is confusion about the date; the restaurant is somehow sold out of all food), but then for increasingly absurd reasons (the couples are all arrested for drug trafficking; a group of terrorists murder them all). Despite the similarity of their premises, however, Discreet Charm is a much freer, more thoroughly surreal movie, mainly because of how it treats death. In Angel, the task of staving off death still makes up part of Buñuel’s narrative. The (somewhat) entrapped partiers must dig through the walls to find a water pipe, or one of the sick members of the crew has to take his medication, or fights break out among the men about the women. But the dinner party of Discreet Charm do die. They’re gunned down by terrorists in the middle of the dining room, just feet away from their meals. But we then cut to one of the party in their bed, startled awake: it was just a dream. Buñuel pulls this trick repeatedly in the back half of the movie, as the stories become more and more fantastic. But the dreaminess of it doesn’t undercut the fact that that which is kept off-screen in Angel (literally—the only people to die in the movie, a couple who die in one another’s arms, happens in a hidden closet off-screen), the threat of death, is explicitly brought on stage in Discreet Charm. But even death can’t stop the show. Our characters trudge on towards their dinner date that never comes. 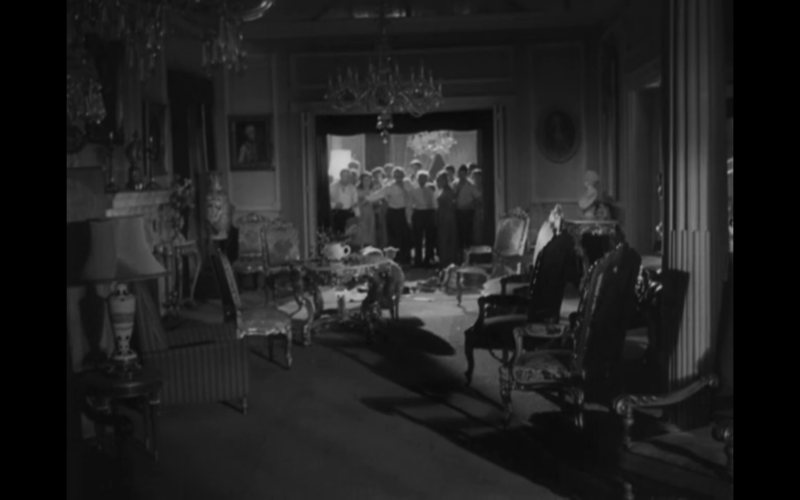 It’s that death that never arrives that makes The Exterminating Angel such an operatic film, and one which Adès can adapt in his highly modernist style. The atonal cry of modern, post-Schoenbergian opera expresses the anxious fear of death. The complete absence of the possibility of harmonic resolution announces the loss of any firm grounding that will prevent death’s slow arrival. But death, in its terrible way, can provide that resolution—at least, in the form of an end. Discreet Charm’s characters can’t even look forward to their death to free them from the quest for the dinner party. But without that anxiety, they—and the staged world they inhabit—has room for play, for movement (the exact play and movement that Sondheim’s modernist musicals work in). Buñuel’s two films really represent two kinds of surrealism. The highly romantic one that can be traced backwards from Angel to Un Chien Andalou (a movie about which I have to agree with Rick), one in which surrealism is really a heightening of death and angst and everything else; and one that can be traced forward from Discreet Charm, one which can see the same absurdity in being paralyzed by the fear of death as any other kind of belief or fear. One wonders if the modern adaptation-obsessed world of opera and musicals has the tools to follow this latter trend, or if Sondheim’s amalgam of these two films that are quietly very different will smooth over the differences. Only time will tell.